It is the place where Lord Shiva consumed the poison from Samudra Manthan and placed in his throat. This makes Lord Shiva's throat blue and named called Neelkanth. This temple was established to pay regards to Lord Shiva. The temple has an ancient architecture and a very beautiful complex, comprising of a one natural spring where devotees take a holy bath before entering the premises of the temple. The sanctum sanctorum of the temple houses a ‘Shiv Lingam’, the idol of the presiding deity in a phallic form. The walls of temple shows the entire story of Manthan. The timing of the temple is 6:00 AM to 7:00 PM in all days of week. In Summer : The temperature in summer is 21°C to 40°C. In Winter : The temperature in winters is 5°C to 22°C. Neelkanth Mahadev Temple is located at 32 km from Rishikesh. By Air : The nearest airport is Jolly Grant airport. It is located in the Dehradun and the distance is 35 km from Rishikesh. By Rail : Haridwar railway station is the nearest railway station. 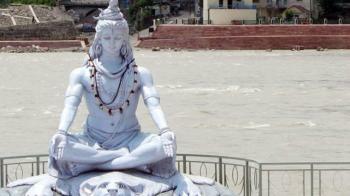 Haridwar is well connected to all major cities and the distance is 25 km from Rishikesh. By Road : Devotees can reach at the temple by hiring the taxi from Ram Jhula, Rishikesh.